Which is not to say they were ready for it. Eleven seasons of throwback, take-no-prisoners football as well as a 2003 neck injury that connected directly to his style of play and threatened to take him out of the game early have had six-time Pro Bowl fullback Mike Alstott on "retirement watch" for years. 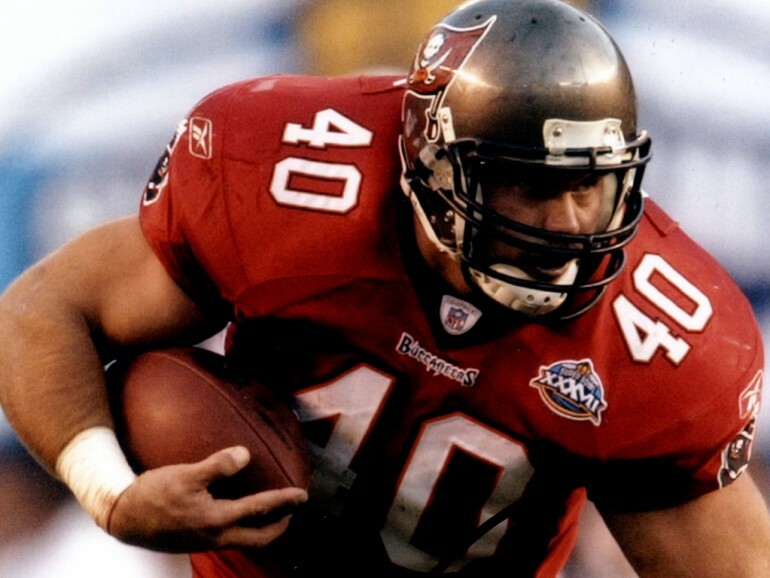 Alstott, though, kept defying the odds by returning to the field, and in 2005 and 2006 he proved that his days of thrilling Buccaneer fans were far from over. He was set to prove it again in 2007 when another neck injury at the beginning of training camp forced him to the sideline again. And that, finally, signaled the end. On Thursday, Alstott finally stepped back from the game he loves, announcing his retirement in front of a packed auditorium at the team's One Buccaneer Place headquarters. On hand for the press conference were his family, Buccaneers ownership, coaches and staff and dozens of teammates past and present. The turnout was not surprising, as Alstott is clearly one of the most popular figures in franchise history, a player held in the highest regard in both the stands and the team's own locker room. He will be intensely missed by a huge fan base that was still clamoring for number 40 to get the football as the 2006 season came to an end. He will be missed within the walls of Buccaneer headquarters, as well. (As we continue to speak in past tense of Alstott's playing career, it's worth remembering that he only just turned 34 and is firmly entrenched in the Bay area community.) It is easy to fete Alstott on the sunset of his playing days, given the breadth of his accomplishments. The only difficulty lies in determining what to emphasize as the most lasting legacy of his days in a Buccaneer uniform.
" In a sport that relies on an absolute commitment to the team, Mike showed up everyday with an unwavering loyalty to his teammates and a desire to do whatever it took to make the team successful. While his talents were certainly unique, it was his commitment to the organization, his teammates and his coaches that separated him." Is it in the numbers, which will dominate the Bucs record books for years? We'll start with our favorite Mike Alstott statistic, one that rather simply sums up what he meant for the team, particularly in his prime: In the 58 games in which Alstott scored at least one touchdown, the Bucs had a record of 44-14. That includes just a 6-6 mark over the last four years; from 1996 through 2002 a span in which he averaged 167 carries per year before it declined to 47 per year from 2003-06 the team was an amazing 38-8 when he found pay dirt. Fortunately for the Buccaneers, Alstott scored often. More often, in fact, than any other player in team history, and by a wide margin. Alstott's 71 touchdowns were 25 more than the number-two player on the list, former running back James Wilder, and more than double any other Buc in the top 10. His 432 points were obviously a high among non-kickers in team history, but only two kickers even bested him (Martin Gramatica, 591, and Michael Husted, 502). A late-season surge in 2006 allowed Alstott to crack 5,000 rushing yards before his career came to an end. He finished with 5,088 yards, trailing only Wilder's 5,957, and his per-carry average was better than Ricky Bell's and only 0.04 yards less than Wilder's. Alstott also invaded the top three on the Bucs all-time receptions list, with 305. Only Wilder (430) and Mark Carrier (321) had more. Mike Alstott is a great talent," said one of his former teammates, quarterback Trent Dilfer. "He was a three-tier fullback. Mike was obviously a great ballcarrier. He could have played solely tailback, and did play tailback for many games. He was a very good fullback from a lead-blocking standpoint. Then he was one of the best natural receiving backs in all of football. We weren't a very talented football team in those days, but if it wasn't for him and his versatility he really started and ended what we were offensively. He was just one of the great football players that I've been fortunate to play with throughout my career. Alstott was a critical part of the Buccaneers' 2002 Super Bowl XXXVII championship run, too. He scored four touchdowns in the '02 playoffs, including the first one in the 48-21 Super Bowl victory over Oakland. He is the team's all-time playoff leader in both rushing yards and touchdowns and has appeared in more postseason games (10) than any other Buccaneer besides Derrick Brooks (11), Ronde Barber (10) and Shelton Quarles (10). Alstott's six Pro Bowl trips also make him the most decorated all-star among offensive players in team history, putting him two ahead of tight end Jimmie Giles and three ahead of center Tony Mayberry. Among all players, Alstott's total of six Pro Bowl selections ties Lee Roy Selmon and trails only Brooks (10) and Warren Sapp (seven). Alstott was also an AP first-team all-pro three times a more exclusive honor even than the Pro Bowl and a second-team choice as a rookie. Is it in the highlights, the images that Buc fans will recall long after they can't remember the exact number of touchdowns Alstott scored? The TD he scored in Minnesota in 1997 when he landed on his feet after an unsuccessful dive over the pile, then bounced to the outside, got turned around and bulled backwards through three Viking tacklers. The pinball run against Cleveland in the Super Bowl year in which nine Browns got a hand on him before he finally went down. The game-clinching touchdown run in the Bucs first playoff win in 18 years against Detroit in 1997. The two-point conversion to beat Washington in 2005. We could go on, obviously. Alstott was blessed with such incredible balance that he routinely kept plays alive long after it appeared as if he was headed down. It was the surprisingly nimble feet that paired with Alstott's 240 pounds to make him a unique weapon in the NFL. Second and third-effort runs like the ones mentioned above and there were enough of them over the years to fill a lengthy highlight reel spoke to his will and determination, but still wouldn't have been possible without his innate physical gifts. "I remember that none of the defensive guys would ever want to sit down on the bench when our offense had the ball because we would want to see how many guys he would run over," said John Lynch, a teammate of Alstott's from 1996-2003. Or is it in the way his teammates will remember him? He has been called, on more than one occasion, the ultimate team player, and few compliments hold more weight within an NFL locker room. "Mike always put the team first and was a great, great teammate," said Lynch. "It was truly an honor to have played with him. Alstott compiled the numbers above despite only occasionally being considered the team's top backfield option. He shared carries with Warrick Dunn, Michael Pittman, Errict Rhett, et al. He shared blocking duties at times with H-backs like Patrick Hape or more traditional fullbacks like Lorenzo Neal. He often got the ball when virtually everyone on the other side knew it was coming to him, whether it be at the goal line or in the fourth quarter of a close game. Because there were so many of those highlight-reel runs to remember, there was often an undercurrent among his fans that he should be carrying the ball more, an opinion that lasted until his final days. Each year that he made the Pro Bowl, his invite came coupled with grumbles that he wasn't a real fullback, that he should be counted among the tailbacks. And Alstott's response to all of this, to the shared duties and the labels? Without fail, year after year and game after game: Nothing. Never one to complain about his role or any other matter regarding his team, Alstott simply did the jobs assigned to him and tried to lead by example. There is no real controversy to weave into the story of his 11-year career and there very easily could have been, had he chosen to shine the spotlight on himself. But Alstott wasn't about tumult; he was about team. In a sport that relies on an absolute commitment to the team, Mike showed up everyday with an unwavering loyalty to his teammates and a desire to do whatever it took to make the team successful," said Buccaneers General Manager Bruce Allen. "While his talents were certainly unique, it was his commitment to the organization, his teammates and his coaches that separated him. As a result, he will always be a Buccaneer, even after hanging up his cleats. He played for only one NFL team, made the Bay area his home and converted legions of Floridians into A-Train fans, one rugged yard at a time. Mike Alstott retired from the football field on Thursday, but his place in Buccaneer history is permanent.